The sea around Malta is very beautiful but visiting the Blue Lagoon in Comino is even more enchanting. The Sea Adventure Excursions just does this. Malta Info Guide had the opportunity to go for a day cruise to Comino on board the catamaran. We were immediately impressed by the cordiality of the staff. We also include the comments of those people who have used the services of this catamaran. - When Shall I Book? What is so great about this boat? - The boat being a catamaran is fast and since departure is from Bugibba the trip is not long. - The owners are always on board and this is an added bonus for the good quality service offered. - Comfortable seating very clean tidy including sun loungers are available. The lower deck is air conditioned great to cool off. - The boat is spotlessly clean throughout and the crew are always on hand to see if anything is needed. - Food and drink served on board are all priced well. - The boat moors at the Blue Lagoon at the best spot available. - The captain keeps the passengers regularly informed of what is happening. - The boat also drives right into the caves for an excellent opportunity to take photos. - It is also equipped with a professional water slide to use throughout your stay. - There is also a glass viewing lower deck to watch the fish and view a shipwreck. - Boat provides snorkeling gear under a small fee. - Life jackets are provided for those who does not know how to swim. - Available shower facilities, easy toilet access and baby changing facilities. - On arrival at the Blue Lagoon you have a four hour stay. - To rinse off there is the availability of a closed shower for privacy. - Jonathan the captain makes himself known to all and is always happy to chat and ensure all the guests are happy. During the trip he tells the passengers what is happening, what they have to do and what is the location you are passing from. - Families with small children. - People who never snorkeled or dived and wish to see the under water marine life through the underwater windows. - For those who have a limited budget with good prices at the same time the boat offers so many facilities. - For adults who cannot swim or have a limited mobility and can stay aboard in the air conditioned deck. - For people who cannot swim and want to go to Comino for a cultural tour and it is very safe to go ashore. - For those who like to explore beautiful new locations and relax at the same time. It is advisable to book early especially for the summer season starting April to October for those who have a fixed dates time frame for your holiday. These months there are many tourists and places are booked early. Take a look at the refund policy so you will be aware of the conditions at the time of booking your tickets. Group or family packages on request. - Once you click on the link you enter the Sea Adventure Excursions website were you input your trip details. 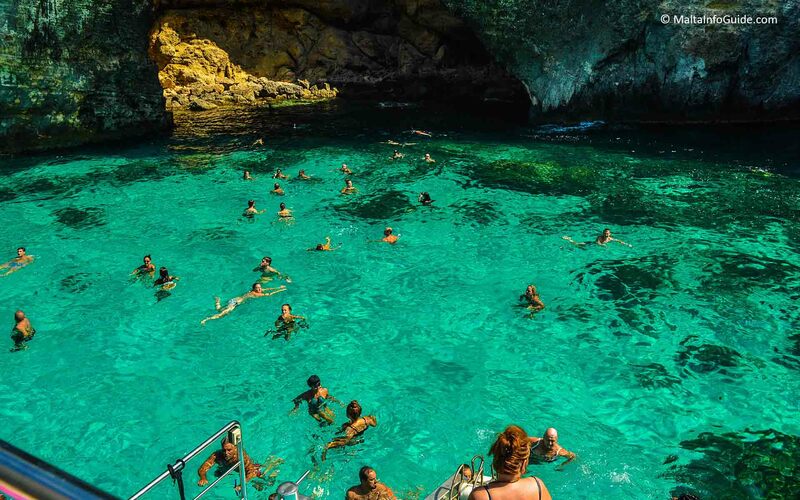 - They choose if you wish the speedboat cave trip or the Gozo sightseeing tour. It is advisable that both trips might be too tight with time to make it within the time frame of the 4 hours stay at the lagoon. - When you enter all the information click on the buy button. - On the next page of the booking, at the top, you will find a field to enter the promotional COUPON and complete the remaining required fields in the last stage to make a reservation. In the case of a booking: In agreement on our offer, we will send you a confirmation of the booking. The client may cancel the order in writing only. In the case of a booking: When you cancel within 7 days prior to the day of the cruise, 50% of the total cost are due. If you want to cancel within 3 days before the day of the cruise, the full price is due. For catering a change in the number of people can always be made within 3 days. In connection with the purchase for the catering we have to charge the associated costs within 3 days of the cruise day. In the case of extreme weather conditions we will set in consultation and without additional charge, a new date that is going to be carried out within 60 days. We provide bus route public transport numbers to help you arrive at the departure jetty. - From Valletta by line 31 stop at Rizzi bus stop (about 55 minutes) then walk for around 5 minutes. - From Valletta by line 48 stopping at Moll bus stop (about 55 minutes) then walk for about 5 minutes. - From Valletta by line 45 (about 55 minutes) - Stops at Bugibba Bus Terminus - Around 20 minutes walk to the Sea Adventure excursions mooring point. The organizers also offers a transfer, so if you are not interested in travelling by public transport, you can book an individual transport for an additional fee, which will take you from anywhere on the island to the starting point of the cruise at Bugibba. Transfers are booked on the Sea Adventure Excursions website which links are provided above in the tickets section. Transfer from Qawra, Bugibba, St. Paul; s Bay and Xemxija are free of any charge. You book the transport through the form from where you buy the tickets. The sea adventure excursions starts taking on passengers at 8:30. It leaves at 10:00, so to get good seats you need to arrive early. the clocks changes to winter time. After leaving the Bugibba jetty it sails along the coast with St. Paul's islands on the right side. It is said that Saint Paul was shipwrecked on these islands on his way to Rome in A.D. 60. It continues sailing along the coast up to the far end tip of Mellieha passing close to the cave of the film 'The Count of Monte Cristo' filmed in Malta in 2002 for everyone to take photos. It is a moment where most on board come out on deck to admire the beauty of the cave, immediately the boat reverses out and continues with the trip. Sailing further up between Malta and Comino we pass by the Knights of Malta coastal battery known as the 'Batter of Saint Mary', further up the imposing St. Mary's tower. They are both on Comino Island. Just here there is the Crystal Lagoon where it stops for one hour. Then again it sails straight to the Blue Lagoon mooring at a very comfortable point for disembarking and start your stay on the island remaining here for 4 hours. After a while the sea adventure excursions sails to Mgarr harbour in Gozo just a 15 minutes trip one way. The persons who had already booked the Gozo sightseeing tour or the transport will disembark. Then the boat returns back to the Blue Lagoon and remains there till 16:00 where it leaves again to Mgarr harbour to collect the passengers and sails back to Bugibba arriving at 17:15. For the remaining stay at the Blue lagoon of around 2.5 hours you can either stay on the boat jumping on and off the boat and using the slides. In the peak months the lagoon is over crowded so you have various options. Either stay on the boat as a base, swimming, snorkeling and enjoying the comforts of the boat. 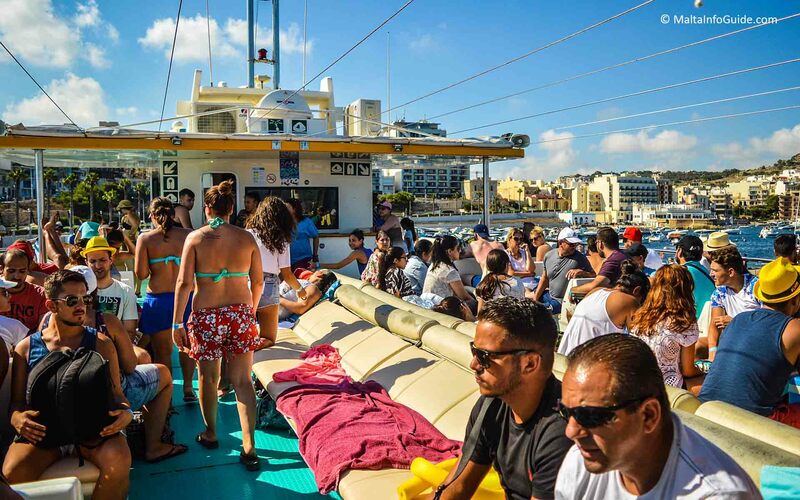 Sunbathing on comfortable soft mattresses, inside air conditioned seating area where it includes the snack bar a comfort not found on the island which can be enjoyed on board as being an added commodity on Comino. In this way you can enjoy the surrounding unusual relaxing environment. On the other hand you can explore the island. With a 15 minutes walk you arrive at the Comino hotel. You can enjoy the small quiet bay besides the hotel swimming and sunbathing. You can also go to the reception area and can enjoy a snack in an air conditioned environment. Further up than the hotel you can walk for around 15 minutes and arrive at the Santa Maria sandy beach. Usually it is not crowded. You can rent sun-beds. The sea is clean and beautiful and very quiet. You can also hike around the island walking up to the Santa Maria tower, beautiful views. Just to be aware that you have to have a hat, water and comfortable shoes as in the summer months the environment is very hot. The visit of one hour to the Crystal Lagoon is considered by many as the highlight of the trip. It is so beautiful. The sea is surrounded by a high rock face and the cave is so impressive. The sea is very clear same colour as the Blue Lagoon. On the side of the cliff there is the Knights of Malta imposing tower fortification. All together the atmosphere is great. Photos we include in this page show this lovely cave location. The stop enables everyone to have a dip in the beautiful sea. It is an experience seeing people using the slides relaxing and enjoying themselves. All tourist boats stop here for a while relatively few people swim here as they go to the Blue Lagoon. So swimming here is recommended in this amazing cave around you and so peaceful to swim through. It is also an opportunity to take great beautiful pictures. Those people who are not familiar or do not know how to swim well are provided with life jackets and can also enjoy swim. The cave has a ceiling hole leaving a good effect on the cave surrounds. After an hour the sea adventure excursions proceed to the Blue Lagoon. The sea adventure excursions offers tourists the opportunity to visit Gozo in the afternoon which costs an additional €5.00 onto every age group. The catamaran takes you to the Mgarr harbour terminal jetty where you are picked up by a mini van (unguided). The catamaran at this point returns to the Blue Lagoon and picks up the same passengers before going back to Malta at 16:15. The transport takes you to 2 different locations for summer through a duration of 3 hours and for winter 3 locations duration 4 hours. The locations to be visited are Victoria the capital city, Xlendi bay and for winter the third location is Ta' Pinu sanctuary. Our recommendation. If you have limited time to visit Gozo this is a good choice but we recommend that if you wish to go to Gozo choose a day in your holiday and enjoy the many beautiful things it has to offer. Use coupon code 'maltainfoguide' for 10% discount. When do the cruises take place? The main cruise season is from April to October of every year. For all other months, weather permitting, there is no specific day that the tour will go out. Why should I book a trip before I come for my holiday in Malta? Since the Sea Adventure Excursions has become very popular with locals and tourists, it is important to book beforehand. The price of €20.00 per person is very good compared to other prices when one considers the quality of service and what is offered by the catamaran company. What happens when the weather is not good and the cruise is cancelled? What should I take with me for the day cruise? We recommend the most basic requirements like towels, swimwear, sun block, right comfortable clothing. It is advisable that one wears the swimwear even though there are toilets but due to the number of passengers on board you will be ready. If the cruise is between October and May one might need a light jacket. During the months of January to March one will surely need warmer clothing. Any medications the need to be taken during the day are very important and if they need to be kept under certain temperatures one should get a cooler bag. The Sea Adventure Excursions offers safety deposit boxes on board at an additional fee. Smoking inside the lower deck closed seating area is not permitted. One can smoke on the outside but one has be aware of other passengers who are non-smokers. The captain makes sure to visit a few interesting caves along the way, Smugglers, Coral, Count of Monte Cristo and Santa Maria. It is an experience in itself getting so close inside them. The captain steers the catamaran inside as much as possible giving the maximum view to the people on board weather permitting. In the meantime many tourists and locals come out on the deck to take photos. Visiting the caves always evokes a lot of emotions. An additional speed boat tour is offered while at the Blue Lagoon. Embarkation is close to the catamaran, it is a 20 minute tour where apart from taking you to other caves you will enjoy the speed and the speedboat operator is an entertaining character. Our recommendation. 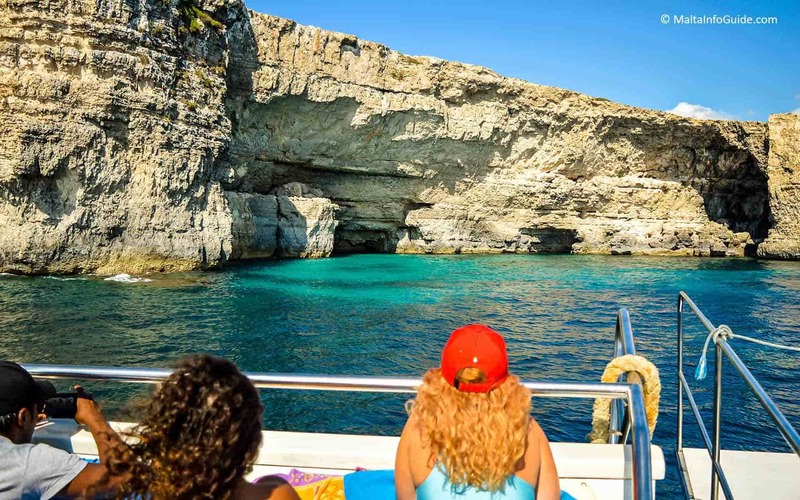 If you intend taking the Gozo tour and at the same time the speedboat cave tour this might interfere with the time of the trips and will be too tight to do both. I advise better to choose one as time is limited. The snack bar on board the sea adventure excursions offers a variety of beef, cheese and chicken burgers, chicken wraps, rolls, chips, ice creams, hot and cold beverages, spirit shots and snacks and these are available throughout the whole trip. The food is very delicious, tasty and cheaper than those sold from the snack vans at Blue Lagoon area. It is good to know as this might encourage you to eat on board with no hassle of thinking about the food for the day. Malta Info Guide would highly recommend this full day excursion with the Sea Adventure Excursions for a couple, family or a group of friends who wish to have a great day out at sea surrounding with the natural landscape Malta can offer. You will save money by booking through our discounted system and make the best of your time. Have a nice time with the Sea Adventure Excursions.